Homemade cheese bread never tasted so good! 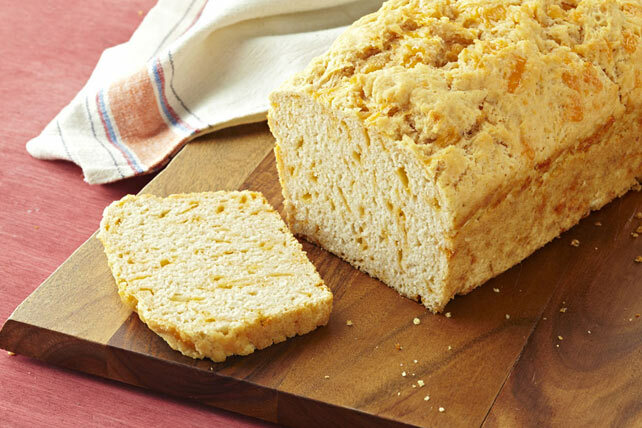 The combination of Cheddar and beer results in a moist quick bread packed with flavour. Pour into 9x5-inch loaf pan sprayed with cooking spray; drizzle with margarine. Bake 35 to 40 min. or until toothpick inserted in centre comes out clean. Cool bread in pan 10 min. Remove from pan to wire rack; cool completely. Prepare using Cracker Barrel Shredded Double Cheddar Cheese. Batter can be prepared ahead of time. Freeze in airtight container up to 2 months. Thaw in refrigerator before pouring into prepared pan and baking as directed. Prepare using your favourite non-alcoholic beer.